A one-year checkup on some of the 24,377 freshwater mussels released last fall into the West Branch DuPage River and two tributaries shows they are doing great and growing, according to Jessi DeMartini, the Forest Preserve District of DuPage County’s aquatic research center coordinator. 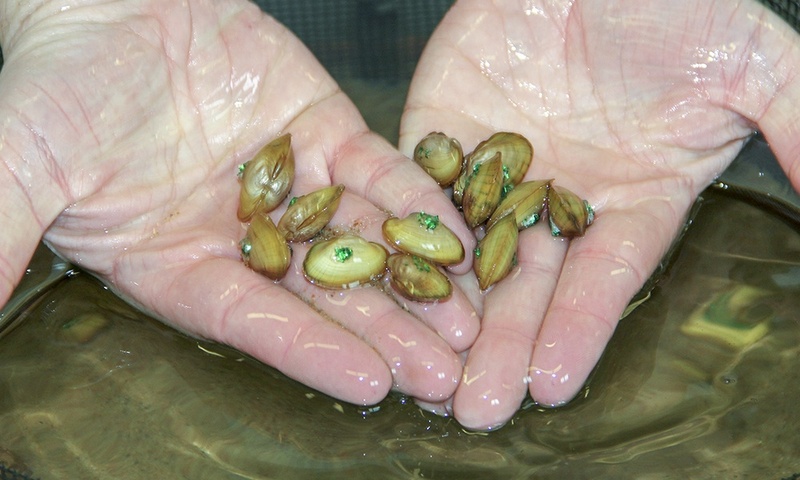 The mussels had been propagated at the District’s Urban Stream Research Center, which opened in 2012 and is the only one of its kind in Illinois. DeMartini and her team from the District’s Urban Stream Research Center went out this summer and checked on a sampling of the freshwater mussels they released last fall to serve as water filters at 37 locations along 18 miles of the West Branch DuPage River between Army Trail Road in Bartlett and the Riverwalk in Naperville. They used an underwater antenna to locate some of the 1,929 mussels equipped with tiny transponders called PIT tags. A PIT-tagged mussel is released into the river last fall. 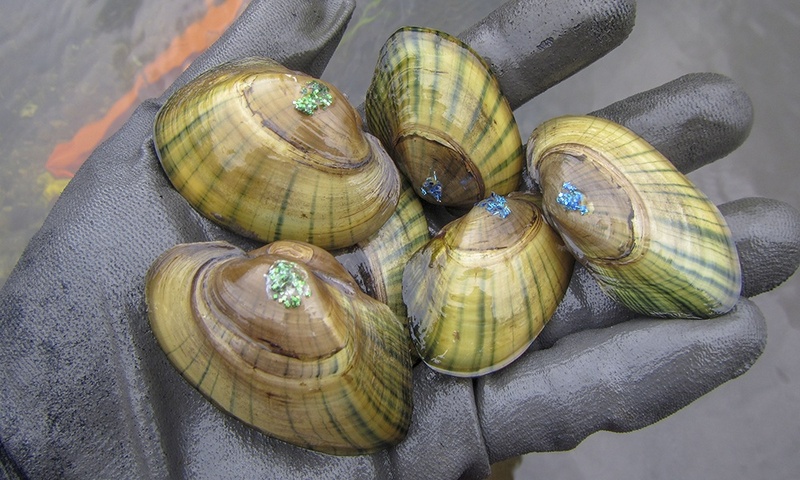 In the photo at the top of the blog, plain pocketbook mussels are in green glitter and fatmuckets are in blue glitter. They found about 65 percent of the plain pocketbook mussels and about 74 percent of the fatmucket mussels, DeMartini said. “Some moved but most stayed in the same spot. Seasonal Adam Halliwell (left) and aquatic technician Jim Intihar use an underwater Biomark© antenna to find the PIT-tagged mussels. 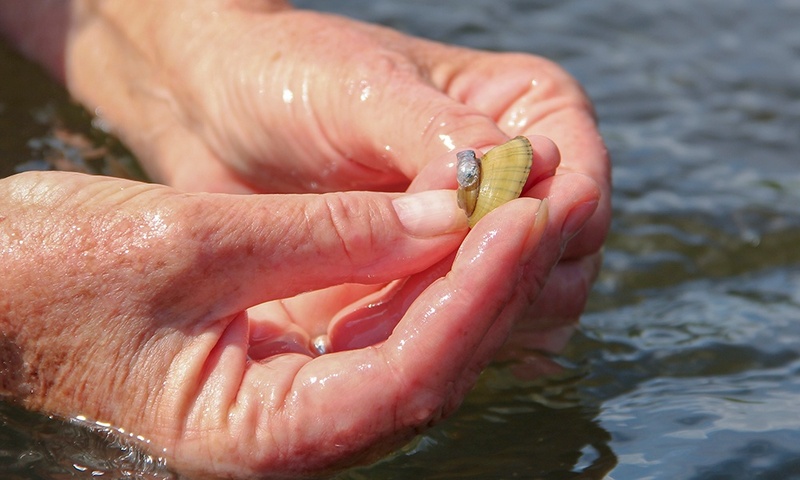 Despite their size, mussels provide enormous benefits because they take in large amounts of water when they feed. In the process, they filter out bacteria, algae, detritus and many other microorganisms before passing clean water back into the river. Just one freshwater mussel can filter 6 gallons of water a day, and because many mussels like to live in groups, together they can filter enough water to lower overall water pollution levels, DeMartini said. Freshwater mussels make up the most imperiled group of wildlife in North America. Over a century of manmade changes to rivers have damaged mussels’ preferred sand-gravel habitats. 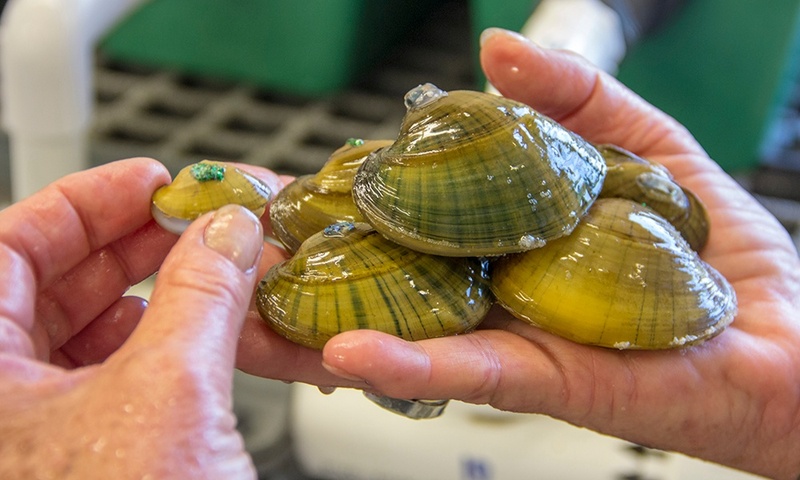 Ammonia and other contaminants are life threatening to juveniles, and competition from invasive species like the zebra mussel has further reduced native populations. As a result, of the 300 known species of native freshwater mussels in the U.S., 213 are listed as endangered, threatened or species of special concern at federal or state levels. In Illinois — once home to 80+ species — more than half are considered extirpated or extinct, state or federally listed, or species at risk. The size of the mussels (left) when they were first released last fall (25 –30 mm) versus their size this fall (65 – 70 mm)(right). The release of mussels into the West Branch came after extensive work by the Forest Preserve District in conjunction with the U.S. Environmental Protection Agency and DuPage County Stormwater Management to improve conditions in and along the river by creating in-stream habitat, preventing erosion, and improving the waterway’s ability to store and handle floodwater. The District manages more than 1,000 acres of aquatic habitats, including lakes, streams and rivers flowing through DuPage County’s forest preserve boundaries. 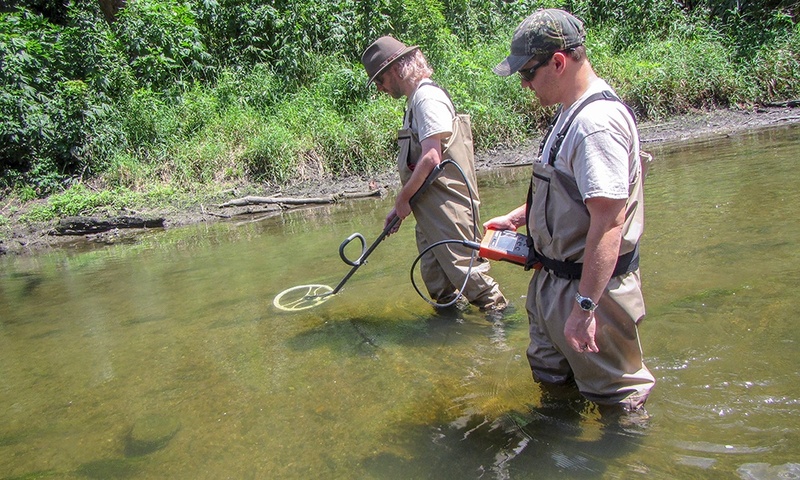 As part of its conservation mission, the District seeks to develop resources for stream-restoration practitioners that improve the physical, chemical and biological health of urban-stream systems in the county. Juvenile mussels getting ready to be released to their forever home in the river last fall. The Forest Preserve District of DuPage County manages nearly 26,000 acres in 60 forest preserves containing prairies, woodlands and wetlands.